The restaurant at The Aubrey. Quirky bars hidden in laneways where the bartenders know more about fashion than fashionistas, unusual interiors in hotel lobbies that are more works of art than standard decoration, food combinations where odd flavours and interesting textures are fused. I’m not the only one into quirky – travellers are booking everything from the wonderfully wacky to the beautifully boutique in search of something a little beyond the norm. So for me, a stay at The Aubrey while in Santiago was a given. Every fashion photographer in town is begging to borrow a room for a shoot, so I go one step further and book two nights. 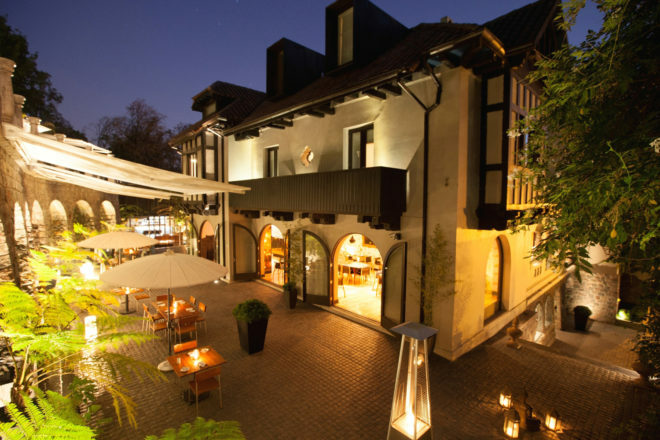 It’s the first boutique hotel in Santiago (though now there’s a flurry of copycat hotels around) and it’s won numerous awards, including a Condé Nast Traveller Hot List award (2010) and The Globe and Mail Architectural and Design award (2010). The Aubrey was listed as one of the top hotels in Chile by National Geographic in 2011. After my dismal arrival into Santiago I’m in need of a treat. As an Australian I need a visa, but I don’t realise this and spend an hour in the wrong line. When I finally do get to the baggage carousal I’m relieved my lonesome backpack is still there, but am then stopped at customs (forgotten Peruvian porridge mix in my bag). Two hours later I’m out and enter Chile to a crowd of people clapping, cheering and waving flags around – mistaken for a soccer hero. The Aubrey is in a top spot – Santiago’s hipster hangout Bellavista, where youngsters spill out of grungy bars, cigarettes and drinks in hand. It is the epicentre of trendy Santiago and The Aubrey is a street away from the bustle, at the base of Santiago’s Cerro San Cristóbal. As far as location goes, The Aubrey gets a tick. Diago from Portugal (I soon learn it’s a very multicultural office) meets me at the front desk. He’s polite, friendly and nothing is too difficult for him. He’s also keen to show me… everything. Diago explains that it took the owners, Australian Mark Cigana and Londoner William Martin, three years to restore and redesign the space. The building was once an abandoned and decaying mansion and the boys preserved the charm of the 1927 architecture through a lot of hard work (re-wiring, re-plumbing, replacing the roof, and doors and much more). In fact to immerse themselves in Chilean culture and the restoration, the boys lived on site for a significant part of the restoration, working closely with the architects. The result is an eclectic mishmash of old and new which works well in the bohemian neighbourhood. The interior space blends muted colours with soft browns, beiges and crèmes, immediately creating a sense of peace and tranquillity. Unusually angled chairs and stools surround a grand piano in the lounge, a sumptuous set of sofas take centre in the lobby, little nooks and crannies lead to more rooms, more staircases, more surprises – it’s a labyrinth of design discoveries. Outside an eclectic mix of chairs and tables are strategically placed around the fern-filled cobbled courtyard, where guests holding all kinds of colourful cocktails are starting to gather. It’s kooky cool and I’ll be back for a drink later tonight, maybe after a dip in the elevated swimming pool which has everything you need; soft towels, two types of citrus-flavoured water, and heaters… OK I’m a little bit impressed. The Aubrey has 15 rooms. Some feature imposing wood detailing, others have original parquet flooring. But all the rooms are furnished lavishly (Tom Dixon lamps and comfy leather chairs), with unique views. I’m staying in the Mannarelli room, located in the art deco part of the building. I enjoy hanging out on my cute Spanish balcony, which overlooks… more Spanish balconies. It’s lovely to get a glimpse into the real local life from your own verandah. Maybe it’s the Australian in me but I’m a little disappointed there’s no kettle (though all guests are welcome to come to the dining room for tea at any time, and in the afternoons, tea is accompanied by delicious complimentary desserts). There are also no cookies. And no iron. Diago is happy to organise for my clothes to be ironed (free of charge). The clothes are brought up to my room and are left folded on the bed as opposed to being hung up – so still end up with creases. Trivialities aside the magnificence of The Aubrey is not in the rooms (though they are fantastic), but in the overall design aesthetic of the place, the staff, and the breakfast. The two mornings I spent here were the highlight of my stay. Breakfast was truly heavenly. The waitress, Rachel from Somalia, had the biggest smile I’ve ever seen, and for her, everything was sheer delight – seriously. From the moment she asked me how I like my eggs, to when she saw me sneaking in a third crème brulee (yes desserts for breakfast – amazing! ), she did not stop smiling. The breakfast smorgasbord was bountiful – filled with panacottas, fruit salads, banana bread, other sweets and treats that I can’t even name. This is where I discovered dulce de leche, an oozy, gooey confection derived from caramelised sugar (prepared by heating condensed milk). I don’t get to the restaurant for dinner (Bellavista beckons) but the Chilean fusion menu looks enticing, and from what I’m told the executive chef, Hector Fonseca, does a pretty good job of making it taste that way too. At checkout the staff see me off like a friend. But when I think back they acted like that all along. The space is gorgeous, and the atmosphere terrific, but The Aubrey’s great milieu is thanks to the Diago’s and Rachel’s, and all the others who I didn’t get to know on a first name basis. They are the ones that bring life a fabulous boutique stay.